Completely redesigned not too long ago, the 2017 Hyundai Sonata is a midsize sedan that offers something for everything. Completely redesigned not too long ago, the 2017 Hyundai Sonata is a midsize sedan that offers something for everything. Indeed, the new Sonata offers plenty of comfort and safety features, but it is also a blast to drive and very spacious. There are two gas-powered engines to choose from to go along with a hybrid model, and plenty of versions packed with the very latest features. No wonder the 2017 Hyundai Sonata is so popular. The 2017 Hyundai Sonata is offered starting at $24,799, and comes standard with a 2.4-liter, inline four-cylinder engine that delivers 185 horsepower and 178 lb.-ft. of torque. Paired with a six-speed automatic transmission, this engine happens to be more powerful than what we find under the hood of most current midsize sedans. That said, if you need even more power, Hyundai has you covered. Indeed, the 2017 Hyundai Sonata 2.0T Sport gets a turbocharged, inline four-cylinder 2.0-liter engine that delivers 245 horsepower and 260 lb.-ft. of torque at just 1,350 rpm. On the road, the 2017 Hyundai Sonata 2.0T Sport is certainly a blast to drive, and offers agile handling and a sporty overall demeanor to go along with all that power under the hood. Both engines are paired to a six-speed automatic transmission, and every 2017 Sonata features various drive modes which modify the parameters of the Sonata’s various mechanical components in order to make the car sportier, more comfortable or more fuel-efficient. That said, the 2017 Hyundai Sonata, regardless of which engine or drive mode you choose, offers impressive fuel economy numbers. Indeed, the turbocharged engine has an average fuel economy rating of 10.4 liters per 100 kilometers in the city, and 7.4 liters per 100 kilometers on the highway while the 2.0-liter, four-cylinder engine has an average fuel economy rating of 9.4 liters per 100 kilometers in the city, and 6.5 liters per 100 kilometers on the highway. The 2017 Hyundai Sonata comes standard with heated front seats, 16-inch aluminum wheels, Bluetooth, and a 5.0-inch touchscreen with an integrated rear-view camera. The GLS trim offered starting at $27,499 features a sunroof, a heated steering wheel, heated rear seats, rear backup sensors, a power driver’s seat with eight-position adjustments, and blind spot monitoring. A panoramic sunroof, twin-exhaust tailpipes, Android Auto and Apple CarPlay connectivity and a seven-speaker audio system are found in the Sport Tech trim, which starts at $30,649. Finally, the Limited model adds xenon headlights, cooled front seats, active safety features such as automatic braking, adaptive cruise control, lane departure warning; leather seats and a 9-speaker audio system. Along with its more powerful engine, the 2017 Hyundai Sonata 2.0T Sport starting at $36,249 also features aluminum pedals, 18-inch wheels, a flat-bottom heated steering wheel, and sport-tuned suspension. 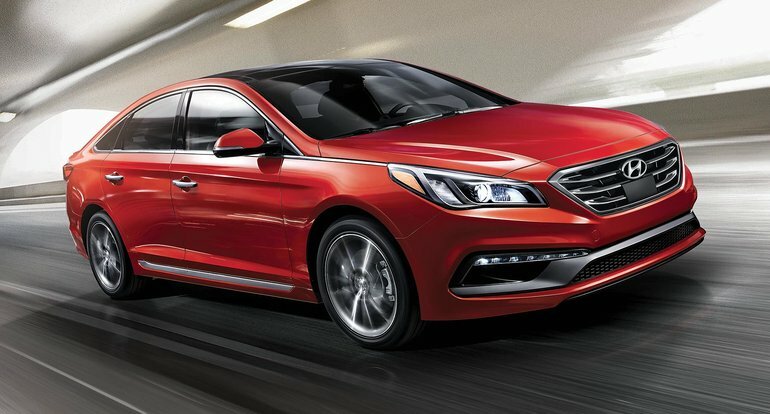 To learn more about the 2017 Hyundai Sonata, contact us today at Bruce Hyundai!